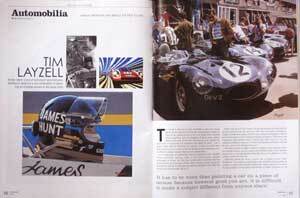 Tim Layzell was born into a family with a passionate interest in historic motor sport. While still in the pram he was taken to Vintage Sports Car Club events at famous venues like Silverstone, Prescott and Shelsley Walsh. He showed an early interest in drawing what he saw – sketching Bugattis, ERAs and Alfa Romeos at the age of 3 - and with family encouragement gradually developed his skills, working first in pastel and pencils before moving on to oils and acrylic paints. In 1995, at the age of 13, Tim entered and won the British Racing Driver’s Club’s prestigious Young Motoring Artist Award, open to artists up to the age of 23. Part of his prize was to have his winning paintings – of the winning C Type Jaguar during a pit stop at the 1953 Le Mans 24 Hours race, and Duncan Hamilton drifting through one of Silverstone’s fast corners in an HWM – exhibited alongside some of the World’s greatest motoring artists at that year’s Coys International Historic Festival at Silverstone. Tim’s work proved immensely popular and from that moment on his paintings have continued to mature not only as his artistic skills have developed, but also drawing on his encyclopaedic knowledge of motor sport history and his own unique insight on that history. The result is some of the most evocative images of some of the greatest moments in the sport. Tim has developed two distinct motoring art styles. In one, he paints with an eye to super realism and super detail while maintaining an element of nostalgia, reflecting the unique tones provided by the colour photography of the 1950s and early 1960s. In the other, he paints in his own, distinctive, ‘pop art’ style where solid blocks of colour and strong black lines draw the observers’ eye into the work. Whichever style is chosen, each subject remains true to the history and heritage of motor racing, demanding meticulous research and care in terms of historical detail and accuracy. 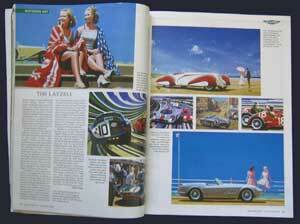 Sometimes as many as a hundred photos may be referred to when researching a subject. In achieving this, Tim is able to draw on a vast library of motoring books and magazines spanning 70 years, as well as making use of his own extensive library of photographs, collated from regular visits to historic motor racing events as a spectator. Tim’s enthusiasm for motor racing and motor sport is all encompassing but the majority of his work focuses on the period from the 1930s – when Alfa Romeo did battle with Bugatti around the streets of Monaco and Mercedes Benz challenged Auto Union around the twists and turns of Donington Park and the Nurburgring – to the 1970s – when cars like the Porsche 917 and Ferrari 512 vied for victory down the Mulsanne Straight at Le Mans. 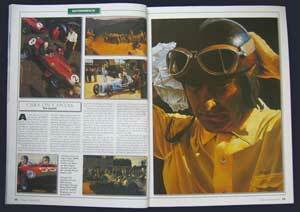 In between these two periods lies what Tim believes to be the ‘golden era’ of motor racing. The 1950s and 1960s produced not just some of the greatest cars of all time, but also the greatest drivers. A particular favourite with Tim is the dynamic, swashbuckling, Mike Hawthorn. Whether he is depicted four-wheel-drifting his Cooper Bristol, D Type Jaguar or Ferrari Dino, Hawthorn is always a popular subject with Tim’s customers throughout the world. Other favourite subjects include drivers like Tazio Nuvolari, Fangio, Stirling Moss, Jim Clark and Graham Hill and cars like the Alfa Romeo 158, Maserati 250F, the Ferrari Testa Rossa and GTO and the Lotus Grand Prix Cars of the 1960s, the 18, 25, and 49 and the BRM cars of the same era. 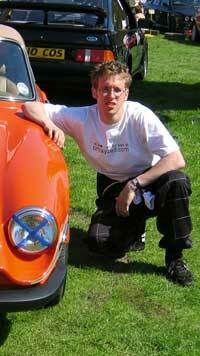 As well as watching motor racing and observing cars, Tim has also been directly involved in motor sport. For many years Tim has competed in road rallies with Bristol University Motor Club and in 2004 Tim bought a 1976 TVR 3000M Turbo – a rare and temperamental beast – which he campaigned in a series of speed hillclimb and sprint events including Wiscombe Park, Longleat and Llandow. The 3000M has now been replaced by a 4.0 Litre TVR Chimaera with which Tim enjoys cruising around the countryside of Somerset and Dorset. The TVR obsession is a family one: his father owns a wide–bodied 1980 TVR Taimar SE while his brother owns a 1989 TVR S2. Within the family the competition centres on polishing rather than performance! Tim’s refreshingly different paintings, both in subject and style, have proved immensely popular at the venues at which he continues to exhibit, such as Goodwood, Silverstone and Monaco. 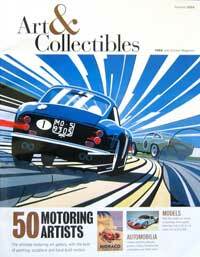 Although he continues to produce a range of work for this type of exhibition, Tim is equally happy carrying out commissioned works where over many years he has continued to hone and improve his skills and his style so that he is now rightly regarded as one of the World’s leading motoring artists. Tim’s work has been spotlighted by a number of magazines and newspapers. Below are some older examples, please visit the 'News, Work and Events' page to view more recent highlights. As Simple As it Looks? Follow the evolution of one of the ‘pop art’ paintings from draft to completed picture. Click here.